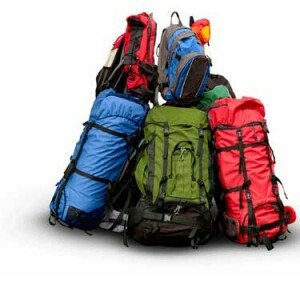 2) Quality: Since your backpack will be constantly exposed to the elements, it is important that it is built strong. Broken shoulder straps, jammed zippers and tears are the most common problems. So, it is best to invest in a quality pack rather than something cheap from the army surplus store. 1) Shoulder straps. Shoulder straps should be both high quality and extremely comfortable. Since the majority of your pack weight resides on you shoulders, try on your pack first to make sure it is as comfortable as it can be. 2) Waist belt: A waist belt is an important feature. It helps distribute weight to your waiste and leg muscles, relieving pressure on your shoulders. You should make sure that the waist best isn’t to high or low and that it fits snugly around your waist. 3) Chest straps: Like the waste belt, they help to distribute weight forward, reducing downward pressure, thus providing a more centered and comfortable feel. 5) Waterproof: If you’re not a fan of mold, make sure your pack includes this feature. As long as your pack has some degree of waterproofing you should be fine. However, if you are traveling somewhere during a rainy season, you should invest in a separate waterproof backpack cover. 6) Backpack cover: If you want your backpack to be completely water proof, you can invest in a separate cover. However, instead of paying in the vicinity of 30$, you can always rig up a make shift cover out of a garbage bag for a fraction of the price. These are just a few basic considerations to take into account before your purchase. In the end though, no matter what kind of pack you decide on, you are sure to get used to it. For information on equipment, such as tents and sleeping bags, refer to essential travel gear.